UNESCO (United Nations Educational, Scientific and Cultural Organization) is a specialized organization of the UN. Its objective is to promote world peace through education, science, culture and communication. The organization is also carrying out an ongoing plan designed to protect “World Heritage”; cultural elements that are considered to be of value to the world. The following are the Latin American sites and cities that have been accredited as World Heritage. It was recognized as World Heritage in 1978. 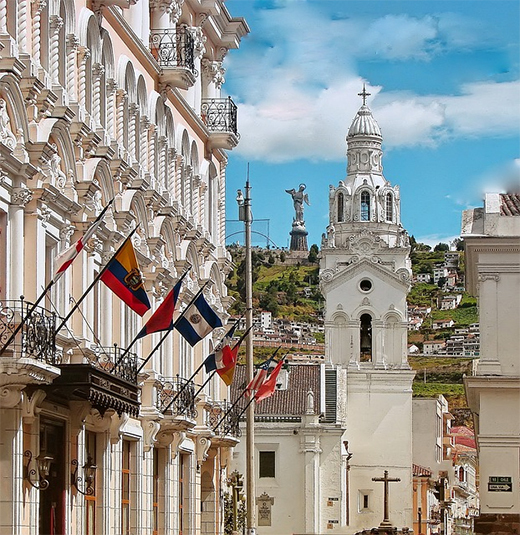 The city of Quito, the capital of Ecuador, was founded in the 16th century over the remains of an old Inca city. Located at an altitude of 2,850 meters, the city’s historic center is the best preserved in all of Latin America despite the fact that it was shook by a devastating earth quake in 1917. The monasteries of San Francisco and Santo Domingo, along with the Church of the Society of Jesus, display an artistic example of the baroque school of Quito, in which observers can see Spanish, Italian, Mudéjar, Flemish and Indigenous influences. This has been a World Heritage Site since 1987. It makes up the original base on which today’s capital city of Mexico was developed by the Spanish in the 16th century. It houses architectural treasures such as the Metropolitan Cathedral (the biggest on the continent), the National Palace, the Zócalo and its Constitution Plaza (the third largest plaza en the world). Just 28 kilometers from the capital, Xochimilco represents one of the most attractive sites in Mexico, with its series of canals and artificial islands built by the Aztecs in pre-Colombian times. The Olmecs first lived here and later the Zapotecs and the Mixtecs over 15 centuries. The canals, embankments and artificial hummocks excavated on Monte Albán’s base are a symbol of a sacred topography. The city of Oaxaca itself represents Spanish colonial-era urban planning and is one of the richest ensembles of Mexico’s artistic heritage. Havana was founded by the Spanish in 1519. Although today it’s a large metropolis with 2 million residents, its old town is made up of baroque and neoclassic elements. It’s a mix of historic periods and a wonderful architectural ensemble where remains of the old city wall continue to stand. Havana’s old town is one of the most touristic areas of the city given the restoration of many churches, fortresses, and historic buildings. The most notable fortress is San Carlos de la Cabaña, a military complex that defended the city from attacks. Given its rich architectural heritage, Valparaíso’s historical center was declared World Heritage by UNESCO in 2003. Geographically, Valparaíso is naturally framed within something of an amphitheater that faces the Pacific Ocean. The urban fabric of the city is woven into the hills that surround it, while the flat areas follow a geometric pattern. An attractive variety of bell towers rise above the landscape. Valparaíso has also effectively preserved infrastructure from the industrial age, such as 15 cable cars. Posted May 25th, 2015 by amerispan amerispan & filed under Travel News & Info.